Bring summer to your table with this easy, simple garden fresh Summer Corn Salad. 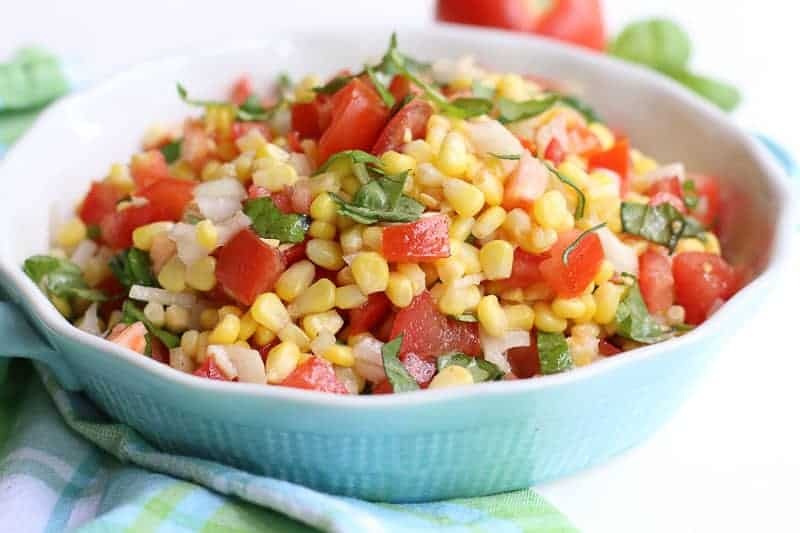 Beautiful vibrant mixtures of fresh red tomatoes, green basil, yellow corn, white onion, and dressing create a pleasing side salad to any meal. This is the perfect way to enjoy the garden’s summer corn and tomatoes. You know summer is around the corner when you start seeing those beautiful bright red tomatoes and the pretty shucked yellow sweet corn at the farmers market. I love a fresh vine-ripened garden tomato. They have a wonderful smell, they are incredibly juicy, and I swear you can taste the sun in every bite. I eat tomatoes every day when they are in season. I make 100s of different tomato salads, BLT sandwiches, plain mayonnaise and tomato sandwiches, and sliced tomatoes with salt and pepper. This bright and cherry summer corn salad is so easy to make. 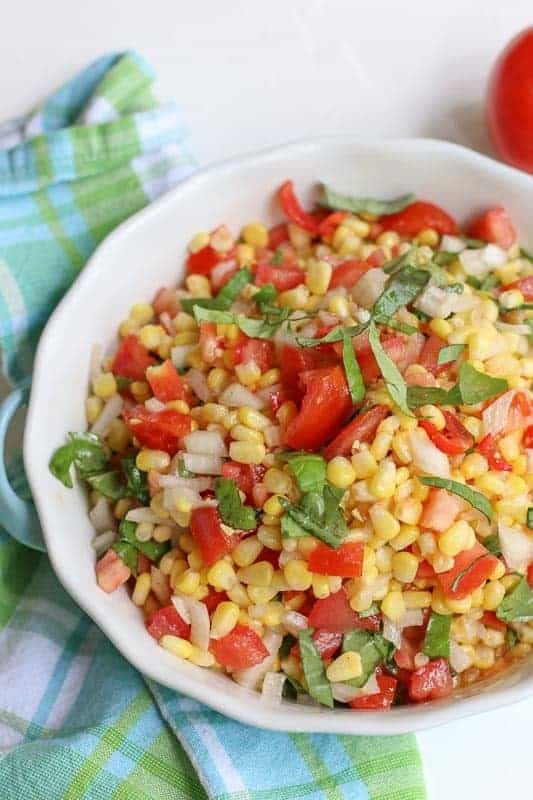 The combinations of tomatoes, onions, corn, and basil make this simple salad very flavorful. You can whip it up and serve it immediately or wait a couple of hours and let it build in flavor. The basil really makes the flavors POP! This recipe is best with fresh corn, but you can use frozen corn also. I would not reccomend the canned stuff. If you want to get really fancy, use grilled corn. It is AMAZING that way. To keep it simple for the recipe, I used fresh corn, but don’t hesitate to use that grilled corn. It is also a great recipe for leftover corn that you don’t know what to do with. Make this summer corn salad for cookouts, pig-pickings, pool parties… Or make it as a side dish for a simple sandwich, grilled chicken, grilled pork. I put it together in about 5 minutes, after blanching the corn. Do you love garden vine-ripened tomatoes as much as I do? If you do, here are some great fresh tomato recipes to try: Quinoa Tabouli, Gazpacho Soup, Spanish Orzo Salad, Southern Hoppin’ John, and BLT Deviled Eggs. Bring summer to your table with this easy, simple garden fresh Summer Corn Salad. 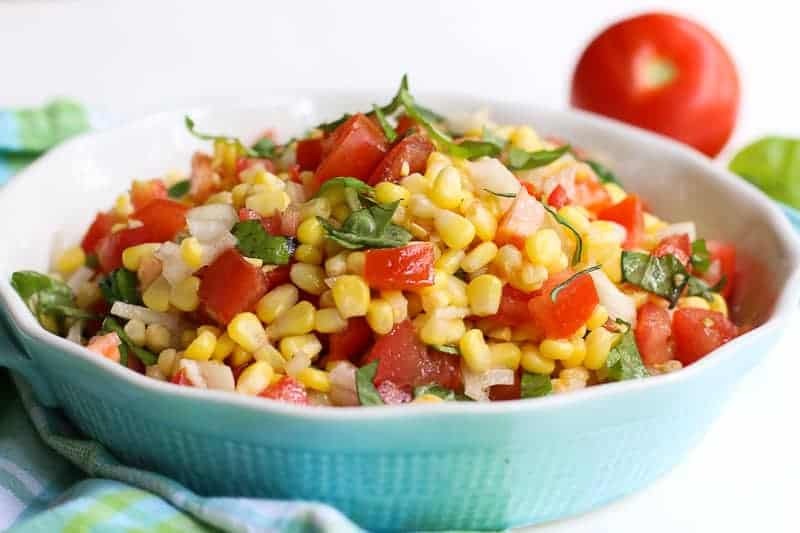 Beautiful vibrant mixtures of fresh red tomatoes, green basil, yellow corn, white onion, and dressing create a pleasing side salad to any meal. This is the perfect way to enjoy the garden's summer corn and tomatoes. If using fresh corn, blanch the corn for 1 minute or grill the corn. If using frozen corn, thaw out corn, but do not heat it. Chop tomatoes, basil, and onions. You can serve immediately, but it is best to refrigerate 1 hour or more for optimal flavoring and then serve. This salad looks so fresh and vibrant! I can think of stacks of meals I would love to serve this with. Yum!